Thrill seekers, Sandy Lake Park is not for you. For the rest of us, this treasure of an amusement park has been delighting all ages for decades. 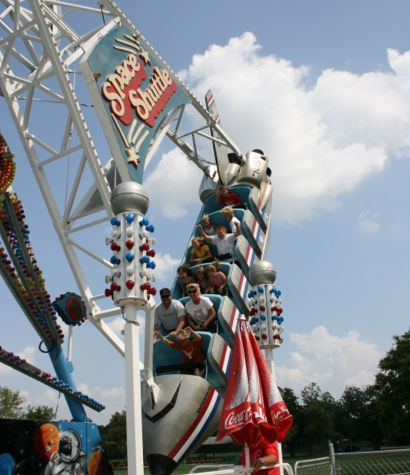 With smaller scale exciting rides, like the Space Shuttle, Scrambler, and Tilt A Whirl, it’s almost like taking a trip back in time to childhood as you wait in the short lines to climb aboard. Rides, however, are just the tip of the iceberg. Miniature golf, giant swimming pools, face painting, paddle boats, pony rides, and an arcade are all at your disposal. In fact, the arcade will certainly bring back memories with the original SkeeBall game and other “vintage” games that require skill. Frank Rush, who works tirelessly at the park to make sure families and groups alike have the time of their lives, can tell stories of the park that make everyone smile. The perfect place to host your next family picnic under the covered pavilions, Sandy Lake Park is a gem that continues to shine year after year.